Can I Use Electrical Tape to Cover the Wire in a Range? Different parts of gas or electric ranges expose wiring to different temperature extremes. Some grades of electrical tape survive temperatures in areas containing control circuitry, but the same tape won't last in a high-temperature location. Burned wires indicate trouble with other components, not the wires themselves. After repairing the cause of the problem, replace the burned wires with new wiring rated for the same voltage and temperature range, instead of wrapping damaged wires with tape. Other insulators withstand heat better than electrical tape. Heat shields and insulation barriers separate the cooking zones of ranges from more delicate parts such as electronic components and wiring harnesses. Terminal ends of electric burner elements pass through the walls of an oven, for example, connecting to the wiring in the cooler compartment behind. 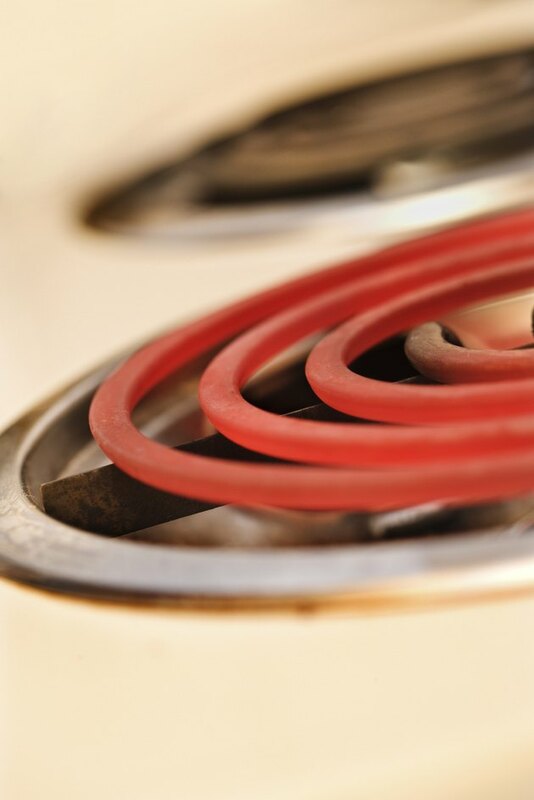 Electronic igniters for gas burners use a similar setup, keeping vulnerable wires away from the most intense heat. In the hotter areas of the stove, wires need insulation with higher temperature ratings. In a Kenmore range, the wire with the highest temperature rating tolerates a maximum of 482 degrees Fahrenheit, according to ManageMyLife.com. Premium vinyl electrical tape commonly sold in hardware stores binds to wires by tension as well as pressure-sensitive adhesive. Two or more half-lapped layers of this tape provide sufficient electrical insulation for wires carrying up to 600 volts, but the vinyl tape only stays stable in a temperature range of zero to 220 degrees Fahrenheit. Four of five temperature zones in a Kenmore range exceed that temperature. Fireproof glass cloth electrical tape with rubber adhesive withstands heat up to 302 degrees Fahrenheit, and safely insulates electrical connections in the control systems of furnaces and ovens, according to 3M. Insulation color, number codes on insulation and parts numbers taken from parts diagrams reveal information about individual wires in a range. These codes mark different requirements for maximum current and maximum voltage as well as safe working temperatures. To know the exact specifications of any single wire, you'll need detailed servicing information for the range. Manufacturers might provide the information free of charge. Replacement wiring often sells as a single part, but an entire wiring harness usually is not needed to repair damaged wiring. Electrical supply stores can supply exact substitutions for individual wires if you can correctly interpret the coding system. Unless applied correctly, electrical tape wrapped over splices can work loose and expose bare wires. Both vinyl and glass electrical tapes require half-lapping. Each turn overlaps the previous winding by at least half the width of the tape. Start beyond the splice on undamaged insulation. Stretching vinyl tape to about five-eighths of the tape's static width marks the right amount of wrapping tension, according to 3M. Always wrap from the smallest diameter towards the largest diameter of the splice. Wrap the last turn with no tension, pressing the adhesive in place without stretching. If stretched, the last turn pulls free.